So, I’ve been working on my daughter’s room for about 5 months now. I have a full mood board my head, it just takes me awhile. I like to take my time and make well-thought-out decisions. I’m sure that is driving you nuts! Get it done already, am I right?! It’s from my PBTeen Inspired Bedding Week where I showed you how to make all this bedding for a fraction of what PBTeen charges. Well, I guess I’m a crappy blogger because I have ZERO zoomed out pictures of her room with her new bedding. So picture her new bed and bedding in place of her old bed. 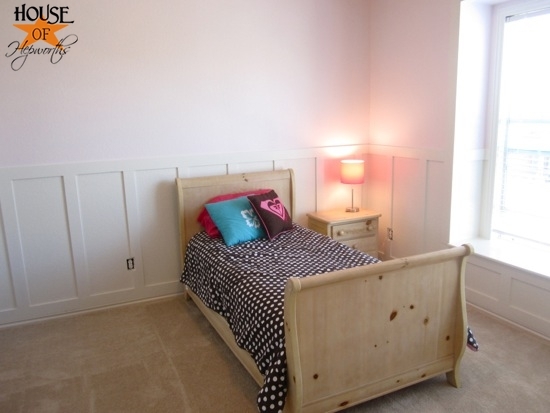 See all the pink walls? I pretty much decided as soon as I was finished that I didn’t like the pink. It wasn’t dark enough to show off my hard-earned DIY board & batten and it also didn’t give off the vibe I was wanting for the room. I hastily chose this pink because I needed something to put on the walls. I’d primed them before I started the B&B so they needed some paint. At that point I wasn’t really sure what look I was going for in the room. You know, I was just free-styling it on a wing and a prayer. Well, the wing and a prayer did me no good because I ended up with pink that was too light and too, well, pink. I settled in on a new color a few weeks ago, and today I just decided to get ‘er done already. Yup. Gray. Are you shocked? (You shouldn’t be if you’ve seen all the other rooms in my house). I instantly fell in LOVE. I’ll just say it. I love this color. I love how the board & batten and trim just POPS right off the wall now. I love how vibrant her bedding looks against the gray, especially all the pink pillows. And I’ll say it again. I love the moulding in here. I loved it before, but now against the gray? I love-it love it. You can actually SEE it. For once, now you can tell how I framed out this window. When I did the b&b I was so excited to show you guys this window (my favorite part of the room) but after I took the pictures, you could barely see it! Well check it out now. So, are you on board with the gray? 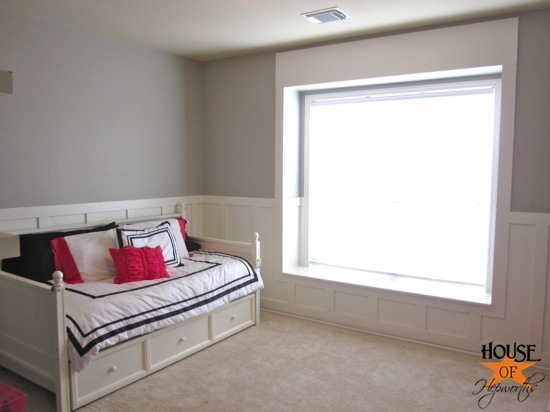 Do you need to see the room actually FINISHED to make a decision on the color? I already bought the curtains. I just have to do some altering and then I’ll hang them. I cannot wait to show you that big ol’ window once curtains are hung. Isn’t this mini clothing form so pretty? My daughter saw it at HobLob and flipped out. She wanted it so bad. Fortunately it happened to be 50% off that day. It still cost me a cool $20. It’s a great large accent piece though and I think it will help to anchor her shelves once the room is finished. I chose gray because I think it will make the room look more sophisticated and elegant. I wanted the pink to be an accent color, not the main color. This way the gray walls actually help showcase the pink instead of all the accessories getting lost in a sea of pink. For those who are curious, the paint is Route 66 by Dutch Boy but I had Lowe’s mix it using their Valspar. Thought I’d give Valspar a try and I really like it. It’s super creamy & velvety and reminds me a lot of the great Restoration Hardware paint. I’ve also used Route 66 in my Piano Room and Guest Bathroom. The bed is from Hayneedle. It’s called the Casey Bed. I did all the board & batten and trim myself. Here’s the tutorial. Here’s the tutorial to make all the bedding. 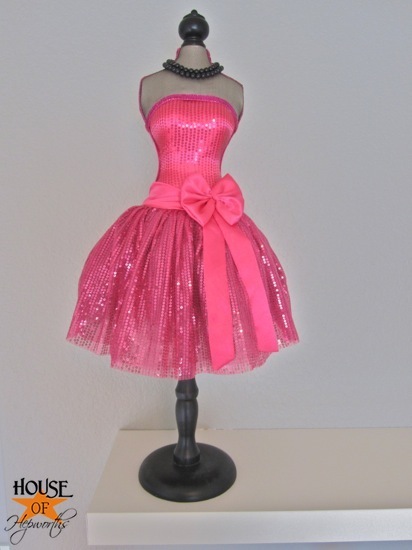 Pretty dress form! 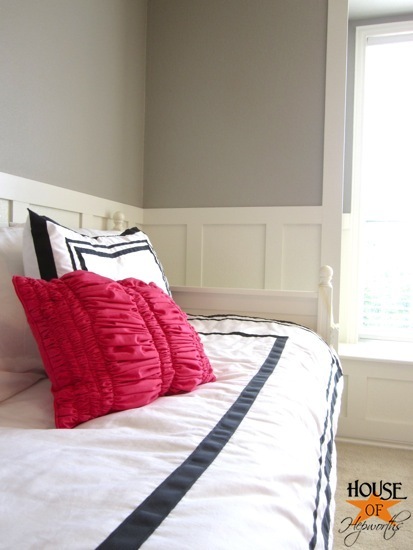 And LOVE the gray walls…L O V E love them! 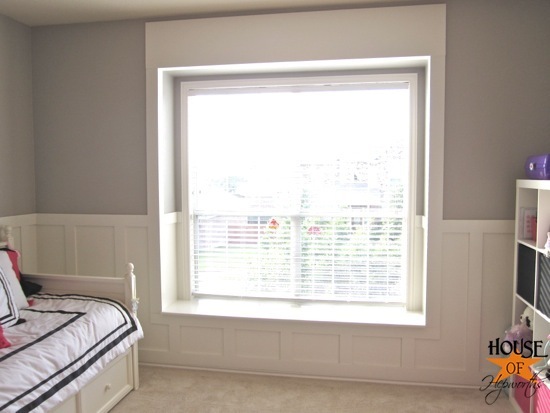 And of course everything else is perfect too…love watching your plans unfold for her room. Oh, I am SO with you on the walls. The gray is perfect. Sophisticated enough to carry her until the next redo, but not so grown up it can’t be enjoyed by her now. I’m sure she loves it! The dress form is stunning. Worth the $20 and then some! Looks great!!! Can’t wait to see more. 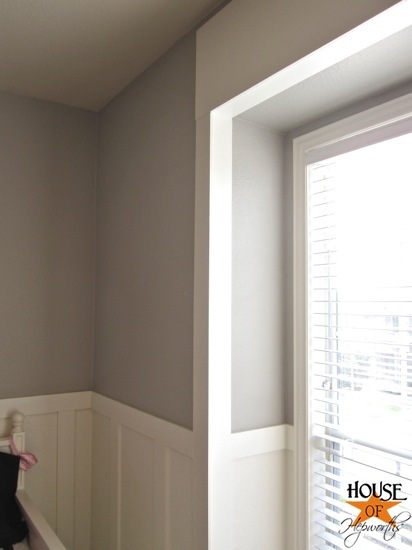 You have *almost* convinced me to try gray in our house! Allison!! The grey looks FANTASTIC!!!!! HUGE difference. Her bed/bedding and the B&B TOTALLY stand out now! LOVE! I love it ALL! Your work is amazing! I really enjoy your blog! Ohhhhh love the gray in there! It sure did make a huge difference! : ) way to go.. Even though we moved 3 times during my childhood (or at least during the ages when I was too young to pick out my own room decor) my mom insisted on my bedroom(s) being Mauve. Not pink. Not purple. Mauve. You couldn’t change anything in the room, because what goes with mauve?! ick. lol. I love the gray. You’re totally right, it makes the trip pop. And that board and batten is so pretty. I wonder if that would work in my toddler room? Hmmm…..
Hi there- first of all I love this room! I can’t wait to see it all done. I have a ??.. 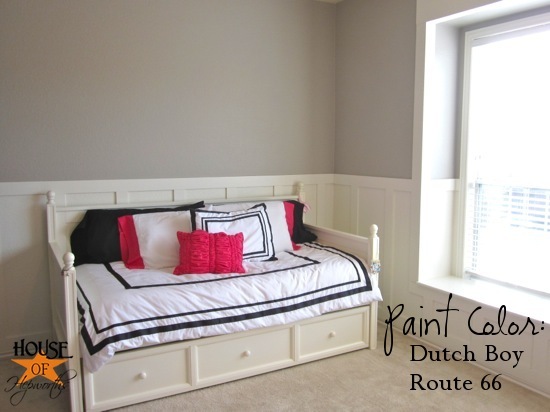 I am always choosing the wrong color paint, and in reading about how the pink looked too light, I wonder: Am I choosing paint colors that are too light? The prob is, my home is very dark… not a lot of natural light-boo- when try paint samples that look great at the store, at home it seems too dark! But maybe I NEED to go darker, right? Anyhoo– love the blog, and the room!! Just starting following your blog a short while ago but I am in LOVE with it! 🙂 I LOVE LOVE LOVE the gray … actually I am planning on painting my boys’ room gray, I just haven’t found the right shade … but … thanks to you, I have found it! 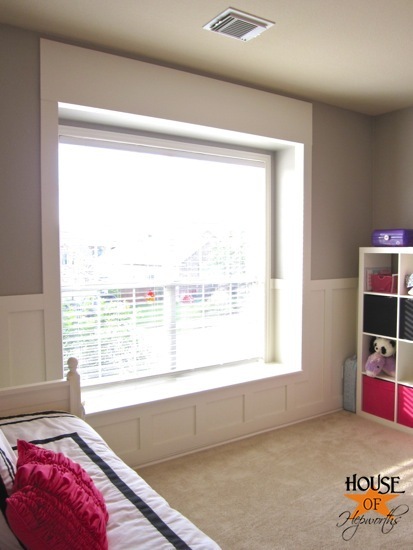 I can’t wait to see your Daughter’s room all finished, you are so creative and talented! I love the gray also. It is perfect. I can’t wait to see how it all turns out. I have to live vicariously, I only have boys to decorate for. haha. Love the gray. It makes a statement by itself instead of blending into a sea of pink. Excellent choice. The molding is beautiful too. You did a great job! 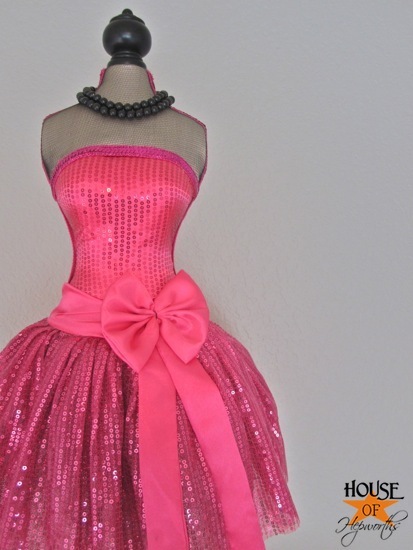 As for the dress form, I got this same one for my daughter’s wedding reception. It matches her colors and is so “her”. Did you by any chance see the lifesize one? Totally awesome but a lot more $$$. Have you seen the Melted Solo Cup things on Dollar Store Crafts? At Costco they have clear colored plactic cups in the right shade of pink and I thought “Hmm a string of those across the window could be cool.” Just a thought. Love the gray walls! And the dress form will tie everything together so nicely! The grey and pink are so perfect! I can’t believe the before-before picture. Shows how much the room AND the girl have matured!